UPDATE: the deadline for the ISMIR 2016 poster printing service has been extended to July 31st. 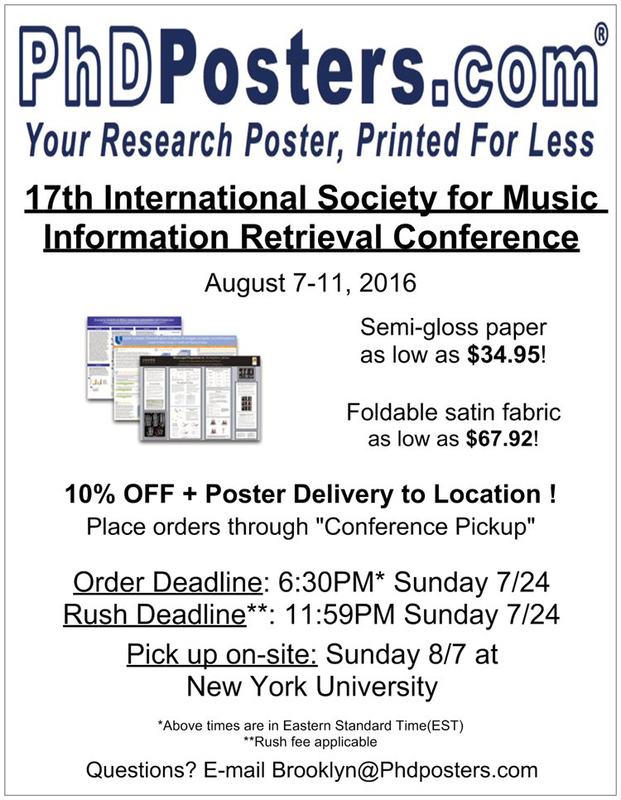 ISMIR 2016 is pleased to partner with PhD Posters to offer local poster printing service. A 10% discount will be applied to any order placed with the ISMIR 2016 discount code. An email with the code link was sent to all authors. If you intend to use the poster printing service and haven’t received this email please write to ismir2016-local@ismir.net. The full price list can be found here. The order must be placed before 7/24 6:30PM EST 7/31 6:30PM EST in order to receive the discount. The posters will be directly delivered to the conference venue. How to use the service: instructions will be sent by email to all authors of papers accepted for poster presentation at ISMIR 2016. You must follow these instructions to obtain the 10% discount and have the poster delivered to the conference venue. Please direct any questions to: ismir2016-local@ismir.net.